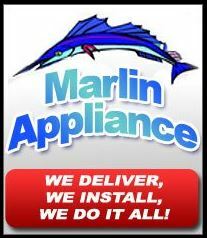 Marlin Appliance is a family-owned discount appliance store based in Seaford, NY. Serving Nassau County and parts of Suffolk County and the five Boroughs since 1948. As part of the nationwide buying group NECO, we are able to provide an excellent selection of appliances at discount pricing, financing options, extended service warranties & exclusive rebates not available at the Big Box Chains. Our personal service, attention to detail, and exceptional product knowledge is second to none. We offer prompt delivery and installation performed by our own employees at reasonable rates so you are dealing with Marlin employees throughout your experience. We can help plan your dream kitchen or laundry room, or help select a problematic in-wall air conditioning system. We are one of the largest authorized Friedrich Air Conditioner Dealers in the US. Whether you need a single replacement appliance or an entire kitchen makeover, choose Marlin for honest, well informed solutions.